A team of researchers uses cutting-edge technology to better predict when and how one of South America’s most active volcanoes will erupt. Tim Ronan, an incoming graduate student in the department of geological sciences at UNC, burries a cable connecting a seismometer to a solar panel on the Llaima volcano. In the small mountain town of Melipeuco, Chile, it is a perfect summer day. Hundreds of people have gathered along the town’s main drag to watch the end of a 70-kilometer bike race. Bikers speed across the finish line to the sound of cheers and applause. Suddenly a different noise pierces through the warm afternoon—a long, low siren—emanating from the town’s emergency loudspeaker system. The siren sounds for 30 seconds, then stops. It does not go off again—it’s only a test. Had the siren sounded twice, it would be time to evacuate the town. This emergency alert system exists to warn residents when the Llaima Volcano, located just 11 miles from Melipeuco, is about to erupt. Among the crowd of people gathered in Melipeuco is a group of researchers—geophysicists, volcanologists, and computer scientists from four different U.S. universities. They have traveled here to install devices that will provide vital information about the seismic activity on and around the volcano. That is precisely what Lees wants the instruments to do on Llaima: track and analyze the volcano’s activity in real time, including during an eruption. 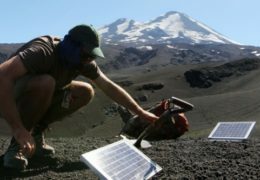 Working with computer scientists from Michigan State University and Georgia State University, Lees hopes to revolutionize volcano monitoring equipment to make it cheaper, more responsive, and easier to transport and install. If it works, this new seismic technology could greatly improve the way volcanoes are monitored—and improve emergency response before and during eruptions. 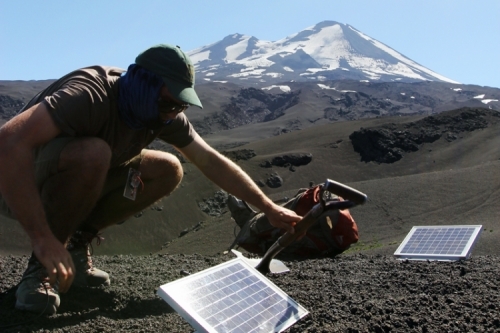 This is how volcanologists typically collect data: they pack up their equipment and hike to a site on the volcano to install a station, which includes a seismometer, battery, and solar panel. The seismometer records the ground’s movements onto a memory card. Four to six months later, the researchers hike back to the same spot, download the data off the memory card, and then compare it to data collected by other seismometers around the volcano. That’s how it works—as long as the stations don’t get damaged or destroyed. The future of seismology is starting here on Llaima. In addition to installing traditional stations, Lees and his team are installing 40 lightweight stations. Each station weighs about 17 pounds, and costs around $350. And unlike older station models, the new stations are networked—they talk to each other. According to Lees, when one of these stations feels a big shake, it reaches out to the others to ask, “Did you guys feel that?” A station can pick up all kinds of movements from animals, or even nearby off-road vehicles. But if the other stations also pick up the extra big shake, that means it’s an earthquake. They respond to the first station’s query and then work together to figure out the exact location of the tremor. After eight hours of walking, digging, and connecting cables, the researchers open up a laptop. The stations are blinking on the screen, already sending messages to the computer. Lees compares the whole system to a brain, with the connections between stations acting like synapses—which makes sense if the volcano is the heart. When the heart starts to beat faster or harder, the brain responds, processing each of those actions. The dream, according to Lees, is to one day be able to drop hundreds of these instruments all the over the volcano—from helicopter. Jonathan Lees is the chair of the Department of Geological Sciences at UNC-Chapel Hill. Dennis Phillips is a PhD candidate in the Department of Computer Science and Engineering at Michigan State University. Paritosh Ramanan and Lei Shi, graduate students in the Department of Computer Science at Georgia State University, also installed new seismic stations. Technicians from the Department of Geosciences at Boise State University assisted with the transport and installation of stations. This expedition was funded by the National Science Foundation.